There are different types of geese existing today; each having its own unique characteristics, physical appearance and vocalizations. Geese are the waterfowls that belong to the family of Anatidae. These types of birds are greater than ducks. These waterfowls are divided into three subspecies: Canada Goose, Domesticated Geese, and Black Geese. Some 10 million years old fossils have been discovered in North America. 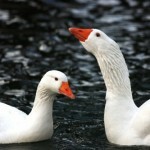 Geese are the monogamous birds in that they make partners for lifetime. 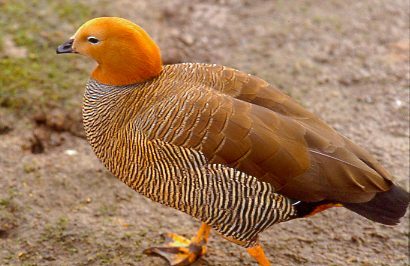 The Orinoco Goose (Neochen jubata) belongs to the family of Anatidae and is also a close relative of duck and swan family. The length of the orinoco goose measures around 61 – 76 cm (24 – 30 inches). These types of geese are normally found in the tropical South America. Like other waterfowls, they build their habitats near coastal waters like marshes, lakes, and ponds.One of the prime reasons is that they can easily find their food in these coastal waters that are dominated by the vegetation. These species are also known to breed in woodlands, forests and savanna. 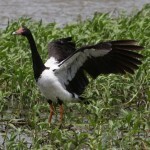 The physical characteristics display a black bill, pale head, reddish legs coupled with black wings. Females are slightly short in comparison to the males. The chicks show a lighter plumage as compared to the adults. These types of geese hardly ever swim. They are the strong territorial birds. Read More: What do Canadian Geese Eat? 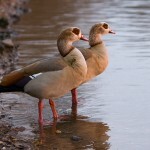 The Egyptian Goose (Alopochen aegyptiacus) belongs to the subfamily of Tadorninae. 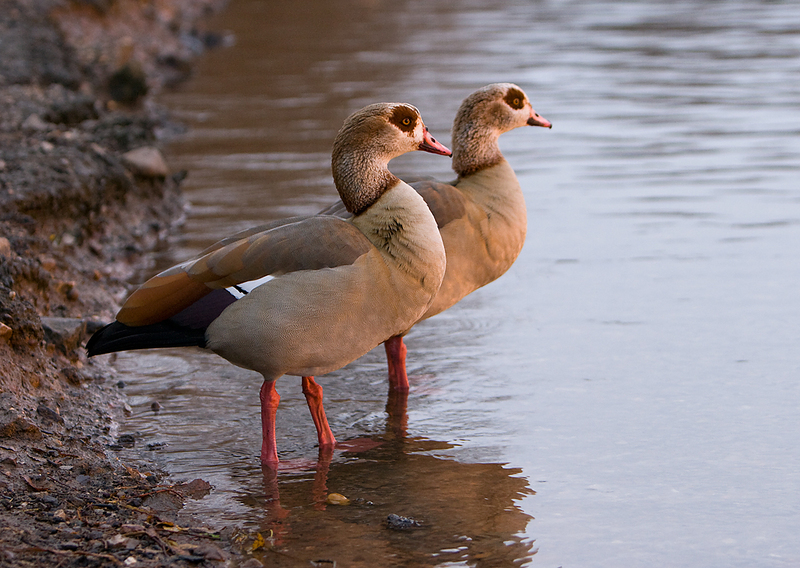 Egyptian geese are known to breed all throughout Africa, Germany, Great Britain, East Anglia, and Netherlands. 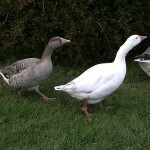 These types of geese are 63 – 73 cm long. They build their habitats in the dense forests near southern Sahara and Nile Valley. These species do not allow uninvited birds to enter into their territories. 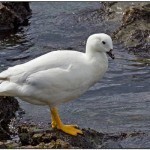 Unlike Orinoco goose, these birds are not reluctant to swim. Egyptian Goose perch on trees and they generally prefer to roost on lofty trees. Under normal circumstances, females are responsible for building nests with the help of grass, weeds, wigs, stems, leaves, and reeds. Both males and females contribute toward incubation process. 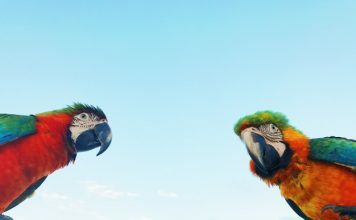 They are believed to be the monogamous birds. Males are slightly greater as compared to the females. These birds predominantly feed on plants, roots, grasses, and leaves. Read More: Where do Canadian Geese Migrate to? The Andean Goose Chloephaga melanoptera also belongs to the same family to which swan or ducks belong. They usually breed in marshes and lakes. These species are found at an elevation of 3,000 metres. There is no significant difference between the plumage of male and female. Andean goose primarily eats grasses. Females lay 6 – 10 eggs. 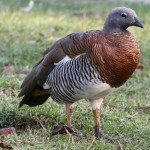 The Upland Goose (Chloephaga picta) is endemic to South America. These birds are also known as Magellan Geese. They have white head and brownish plumage while the legs are yellow. 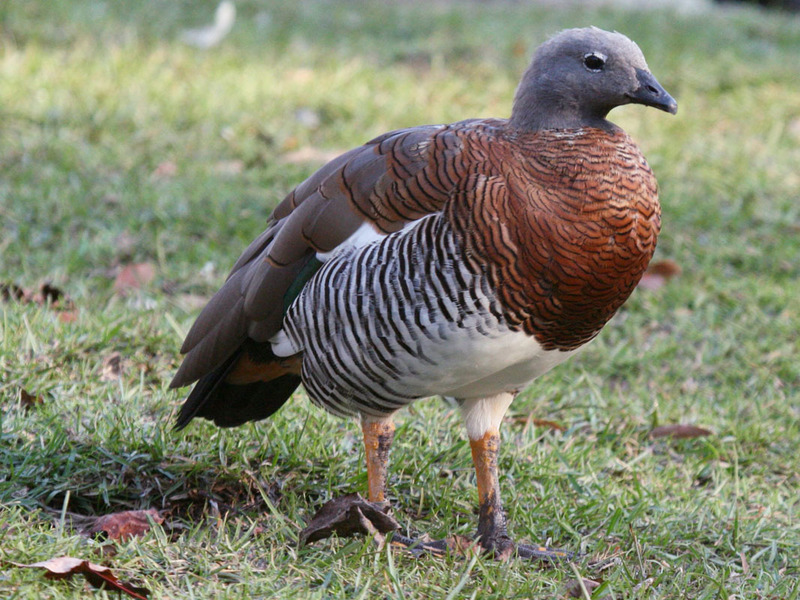 Upland goose is 60 – 72.5 cm (24 – 28.5 inches) long. 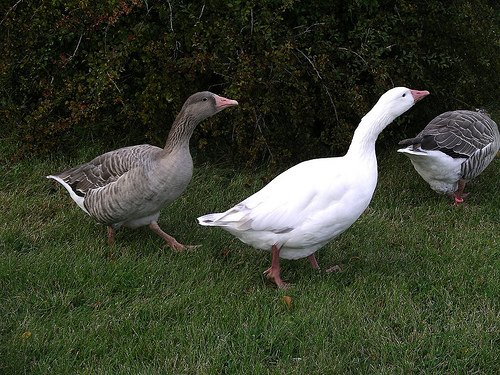 These types of geese weigh around 2.7 – 3.2 kg (6.0 – 7.1 lb). The Kelp Goose (Chloephaga hybrid) belongs to the subfamily of Tadorninae and is mainly found in South America, Falklands, and Patagonia. Kelp geese also breed in Argentine, Falklands, Patagonia, and Chile. These types of geese largely build their habitats in the rocky coasts and crevice. Females exhibit dark brown plumage. The clutch size comprises 2 – 7 eggs. Kelp goose use vegetation to hide their eggs. The total population of kelp goose is about 15,000. They are considered to be the partial migratory birds. 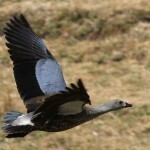 The Ashy-headed Goose (Chloephaga poliocephala) is primarily found in the mountaineous regions of South America. These types of geese also breed in the lowlands and woodlands. Ashy-headed goose is about 50 – 55 cm (20 – 22 inches) long. The clutch size consists of 4 – 6 eggs. The juveniles exhibit lighter plumage as compared to adults. 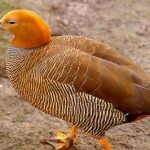 The Ruddy-headed Goose (Chloephaga rubidiceps) is a bird that is known to breed in South America. 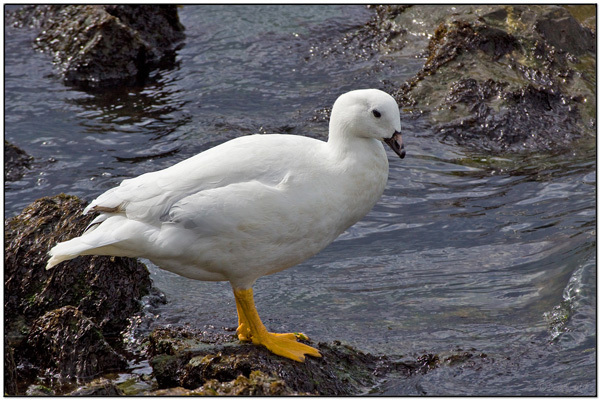 These types of geese are also found in Chile, Falklands, and Tierra del Fuego. These types of South American birds are not common. They are the permanent residents. Females lay 4 – 11 eggs. 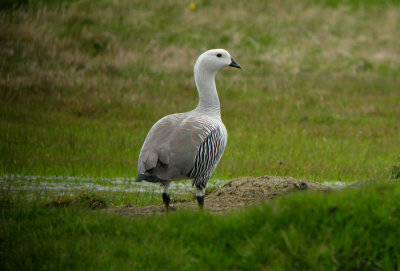 The length of the ruddy-headed goose measures around 45 – 50 cm. One of the most common predators of these birds is South American Grey Fox. 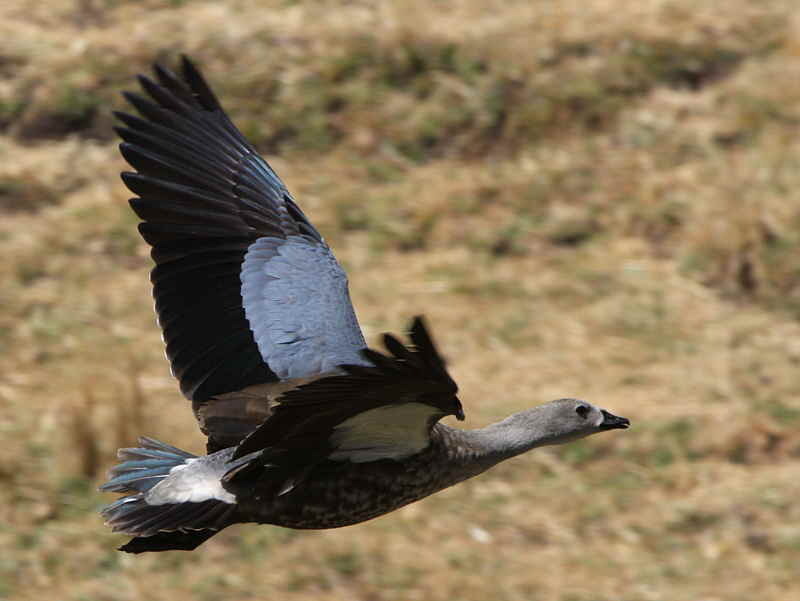 The Blue-winged Goose (Cyanochen cyanoptera) is a member of Cyanochen and is native to Ethopia. 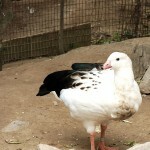 These types of geese are closely related to the Shelducks. 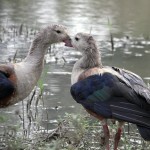 Blue-headed goose is 70 cm (28 inches) long and it has a black bill and legs. 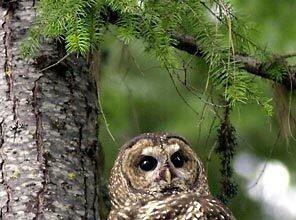 These birds predominantly reside in coastal waters, freshwater lakes, marshes and swamps. They like to live in the tropical and subtropical grasslands. Females lay 6 – 7 eggs. 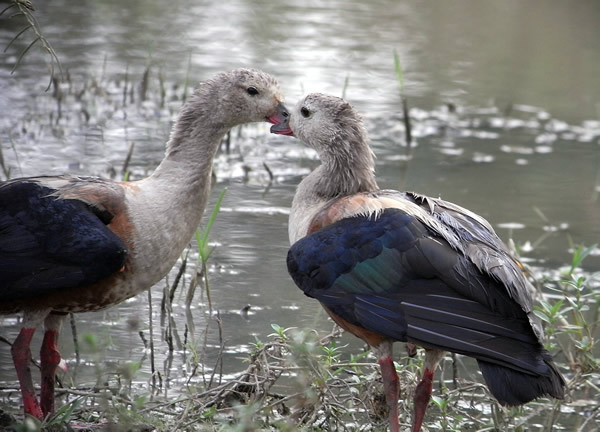 The Spur-winged Goose (Plectropterus gambensis) belongs to the Anatidae family and the subfamily is Plectropterinae. These types of geese are found in the wetlands across sub-Sahara Africa. Spur-winged goose measures around 75 – 115 cm (30 – 45 inches) by length. The average weight is about 4 – 6.8 kg (8.8 – 15 lb), with the maximum weight measures around 10 kg (22 lb). Females are shorter in comparison to the males. The wingspan measures around 150 – 200 cm (59 – 79 inches). Spur-winged goose is by far the largest wild goose. They build their nests and hide it under the vegetation. They also reside in the tree cavities and tree holes. The Cotton Pygmy Goose (Nettapus coromandelianus) is bird that is known to breed in Australia, Pakistan, India, Bangladesh and Sri Lanka. Cotton Pygmy goose is 26 cm (10.5 inches) long. These species weigh around 160 grams (5.5 oz). The feathers are white with a black or green crown. These types of geese build their habitats in tree holes or cavities where females lay 8 – 15 ivory white eggs. These birds are widespread across Asia and the population in Australia is facing a sudden decline. These species live near water, lakes, inundated paddy fields and swamps. They predominantly feed on small insects and crustaceans. 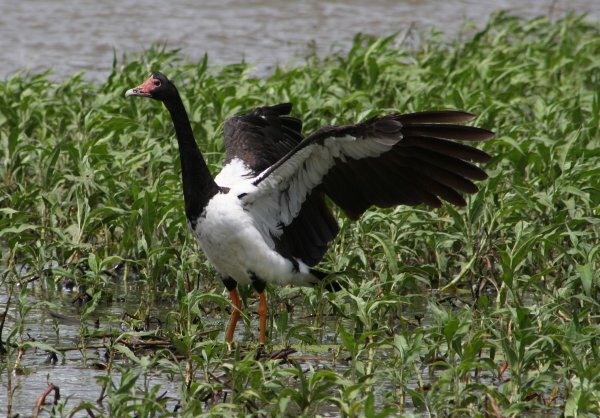 The Magpie Goose (Anseranas semipalmata) is the inhabitant of Australia, New Guinea, and savannah. Unmistakable characteristics of these types of geese make them stand out among other species. They have yellow legs and white feathers. These birds are known to reside in wetlands, swamps and paddy fields. The clutch size comprises 5 – 14 eggs. 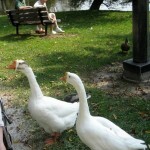 The Cotton Patch Goose is one of the domestic geese that breed across Southern United States. These types of geese predominantly feed on corn, cotton, and weed fields. 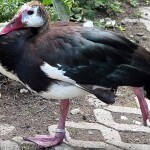 In the Mid-20th century the population of these birds deteriorated which led American Poultry Association to consider it a critically endangered species. They have pink bill and legs. The weight of cotton patch goose is about 8 – 10 pounds. 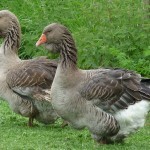 The Shetland Goose breeds all throughout Scotland and Shetland Islands. These types of geese are endemic to Islands. Shetland goose weighs around 5 – 6 kg (12 – 14 pounds). Most of their time is spent on grazing. Females lay 30 eggs annually. The Canada Goose (Branta canadensis) is a bird that is endemic to North Amnerica. These types of geese exhibit unmistakable appearance in that they have black head and neck along with a chinstrap. 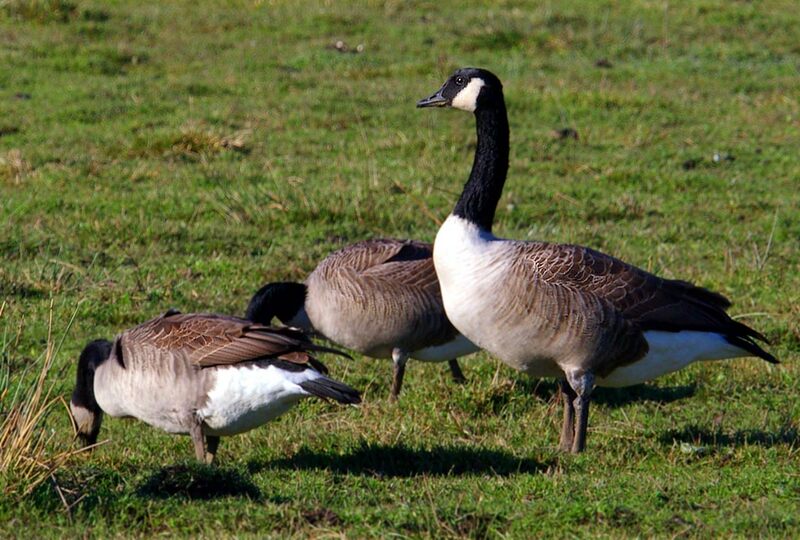 The length of Canadian Geese measures around 75 – 110 cm (30 – 43 inches). The wingspan is about 127 – 185 cm (50 – 73 inches). The weight of the males is 3.2 – 6.5 kg (7.1 – 14 lb). These are the strong territorial birds. Females weigh around 2.5 – 5.5 kilograms (5.5 – 12 lb). The average lifespan of Canadian goose is 10 – 24 years. The largest Canadian goose weighed around 10.9 kg (24 lb), with a wingspan of about 2.24 metres. These types of geese largely build their habitats near freshwater lakes, swamps, streams or ponds. These birds are also known to breed in Siberia, China, and Kamchatka Peninsula, Germany, Great Britain, Scandinavia, and Belgium. Canadian geese are the strong migratory birds. They primarily eat insects, grass, fish, green vegetation, grains, wheat, barley, rice, corn, beans, aquatic plants, and seaweeds. These species are monogamous birds and stay with their mates for the lifetime. Females lay 3 – 8 eggs. Both males and females contribute towards the incubation process. The predators of Canadian goose include Red Foxes, Gulls, Ravens, American Crows, Bears, and Arctic Foxes. 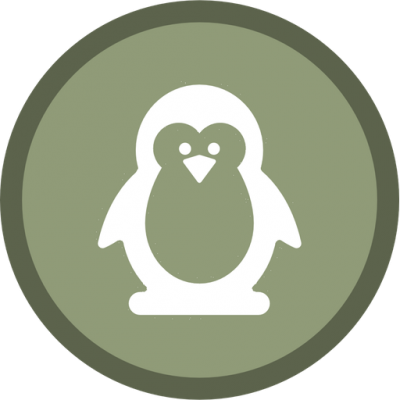 The incubation period lasts for 24 – 28 days. The chicks fledge out after 20 – 40 days. These types of geese migrate but seasonally. While the autumn arrives, Canadian goose start migrating and that usually takes place in the month of September and November. The Embden Goose is a native to Holland and Germany. 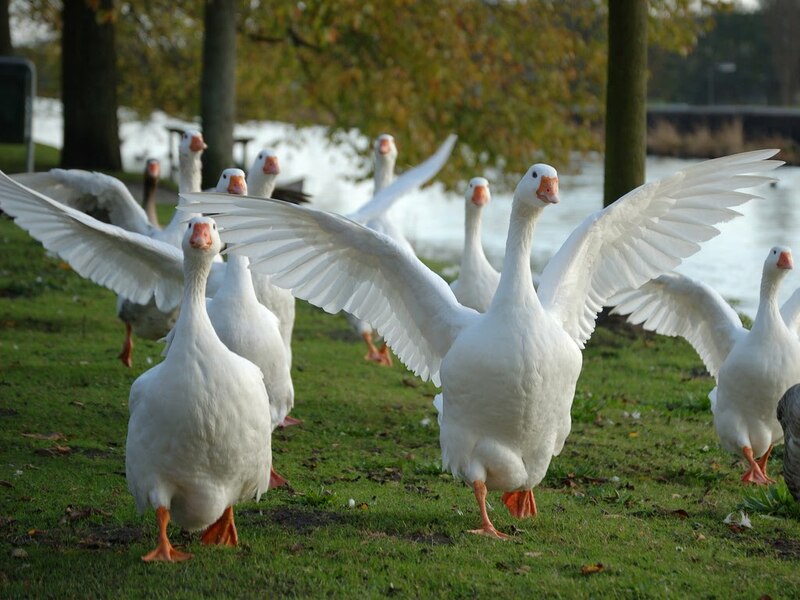 Some biologists maintained in the beginning of the 20th century that these types of geese originated for the first time in Emden, Germany. Emden goose has orange feet coupled with a light orange bill. Females lay 30 – 40 eggs. 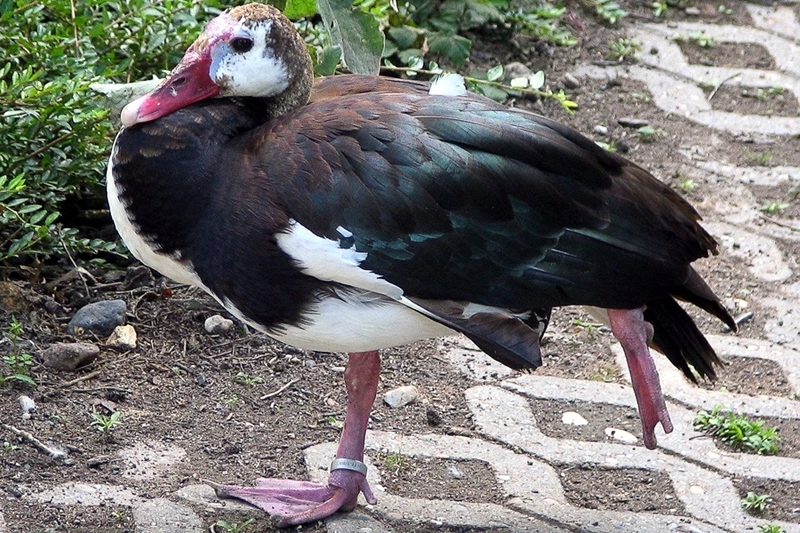 These birds weigh around 9 – 14 kg (20 – 30 lb). 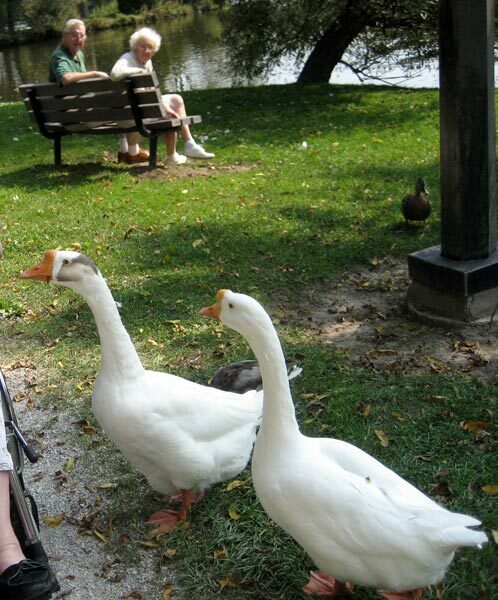 Domestic geese (Anser anser domesticus) are often kept under captivity in order to meet various purposes. These types of geese are widespread all throughout Africa, Asia, and Europe. 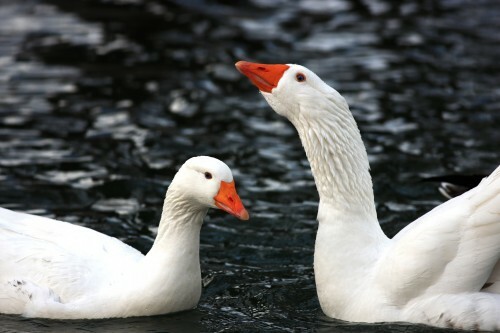 Chinese geese are also referred to as domestic geese. These specie have been introduced in North America and Australia. These birds, because of their unmistakable physical appearance can be easily distinguished. When compared to European geese, Chinese geese have a large knob at the bill’s base. Charles Darwin holds that the domestic geese have archaeological evidence that dates back to 4,000 years ago. The weight had been recorded at 10 kg (22 lb), with the wild swan weighing maximum at 3.5 kg (7.7 lb). Domestic geese females lay 50 eggs annually which is one of the reasons as to why these birds are often kept under captivity. 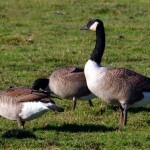 Wild goose lays 5 – 12 eggs. The weight of the domestic goose eggs is around 120 – 170 g (4.2 – 6.0 oz). 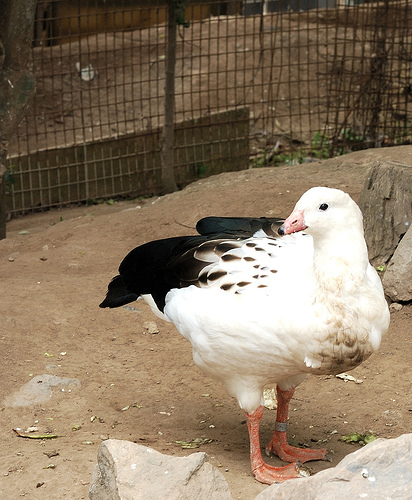 The Chinese Goose is actually a type of domestic goose. 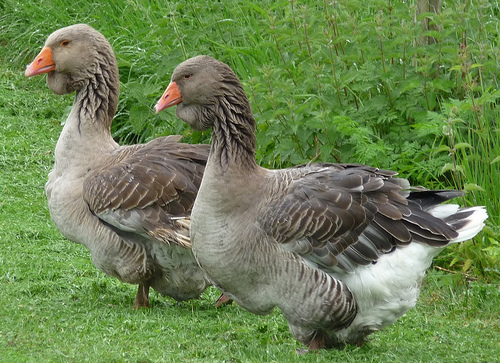 These types of geese weigh around 5 – 10 kg, while females weigh about 4 – 9 kg. Females lay 50 – 60 eggs. 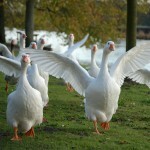 The Toulouse goose is a large domesticated bird that breeds in England. Lord Derby introduced these birds to England back in 1840. These types of geese weigh around 9 kilograms. These species can reside on land even though they are more akin to live in coastal waters. Toulouse goose is habitual in living near residential places and is not considered to be the travelling birds. This makes it one of the best waterfowls to be kept under captivity. Females lay 20 – 40 eggs. 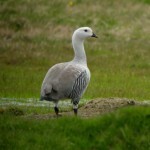 The Vistins goose is mainly found in Lithuania. Vistines goose is one of the domestic geese. The males weigh around 6 – 7 kilograms; whereas the weight of the female is 5 – 6 kg. These birds turn out to be fully mature after 310 – 320 days. Females lay 20 – 40 eggs. These eggs weigh around 170 – 180 grams.